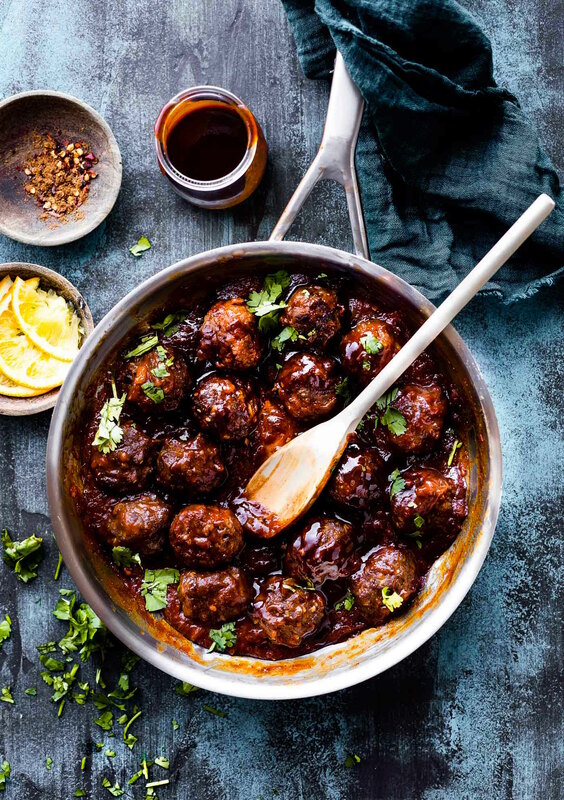 Paleo friendly 5 Spice BBQ Meatballs with a zippy Orange Hoisin sauce! 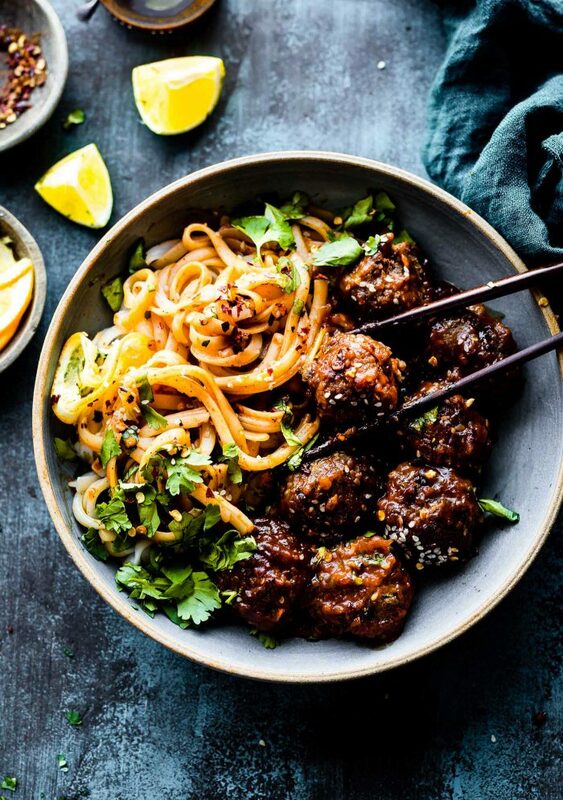 These Asian Style BBQ meatballs are quick to prep and cooked in just 30 minutes. 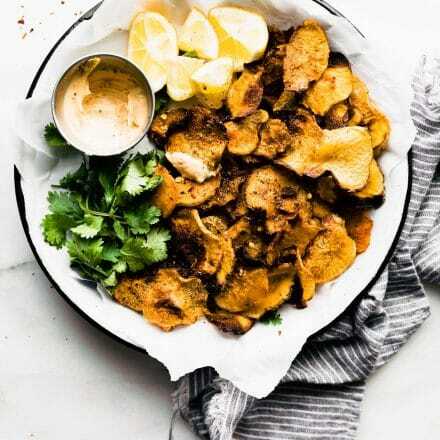 Natural ingredients, no refined sugar options, and packed with lean protein Serve as an appetizer, meal, or a healthy protein for easy meal prep planning. Freezer friendly ya’ll! It’s time to make healthy eat look good ya’ll! Look good and taste DARN GOOD! Let’s start off with these 5 Spice BBQ Meatballs with a Saucy Orange Hoisin Sauce. A paleo friendly iron rich meal that leaves you feeling… well… saucy. Wink Wink. Alright now, I’ll put the humor away. I’m on a New Year’s “feeling focused” high this week. Let’s hope it last. Gosh darn it feels good. Like the smudge has been wiped clean from my eyes and I can see the positive perspective. You feelin it? If not, that’s okay, just keep the ONE focus and it will come around. 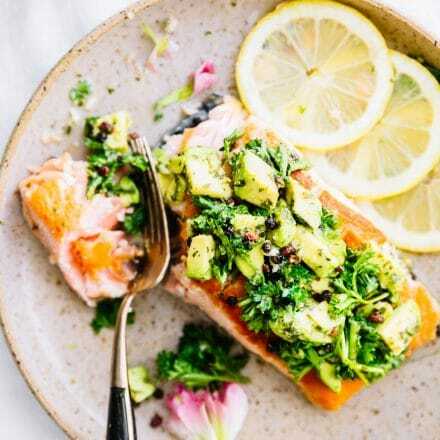 Speaking of focus, let’s focus on easy meal prep recipes, easy Paleo friendly 30 minute meal recipes, easy stress free friendly recipes, and easy freezer friendly recipes. And let’s wrap it all up all into one with this 5 Spice BBQ Meatball recipe, Mmm k? Stay with me here, stay focused. 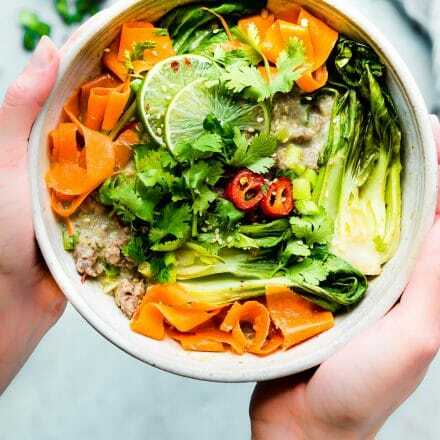 You see, after I took that reader survey a couple weeks ago, I realized that the majority of you all (hello readers) would like more healthy gluten-free meals in 30 minutes or less and that can feed a whole family. That being said, this is the Paleo friendly meatball recipe might just kick off that request, give or take 10 minutes. Cool? It’s made with natural grain free ingredients, mostly unrefined sugar, and did I mention it is so so tasty? Yes you can serve it with Rice noodles… mmmm just look how tasty. 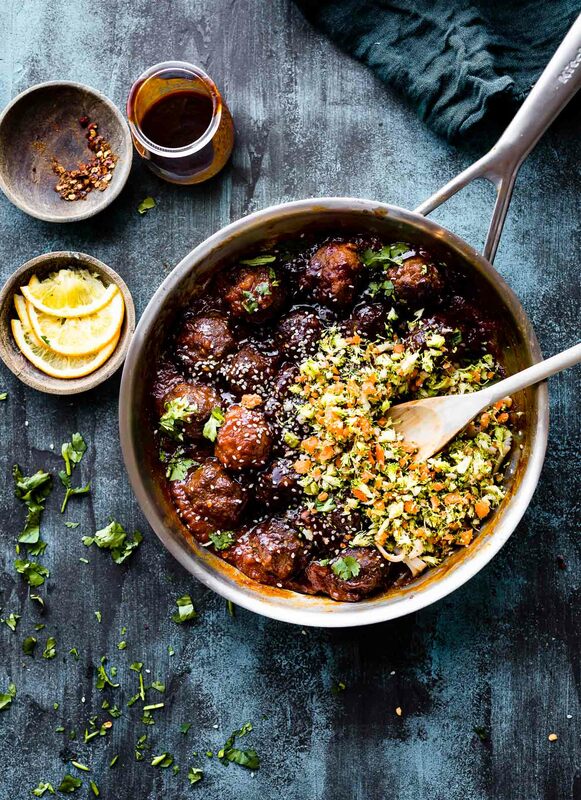 OR, LIGHTEN IT UP and serve these saucy meatballs with cauliflower rice, carrot rice, broccoli rice, or all!. All pair really well with the meatballs, just depends on your dietary needs. Which leads me to the other main reason I posted this recipe. Dietary needs. Did you know that each recipe I create has a specific focus for your dietary needs? Hey, I try my best to keep us all feeling nourished here. And, of course I want to make sure that we can educate each other on why certain nutrients work better together. For instance, I paired the lean beef in this BBQ meatballs recipe with a saucy orange sauce and optional broccoli rice. Oranges and Broccoli are high in Vitamin C. Vitamin C helps the body absorb non heme (plant based iron) and heme (animal based) iron. And further more, heme iron also increases the amount of non heme iron your body is able to absorb. WHOA, loving this FOOD SYNERGY! That means you’re getting more bang for your buck nutritionally when you combine the two together. 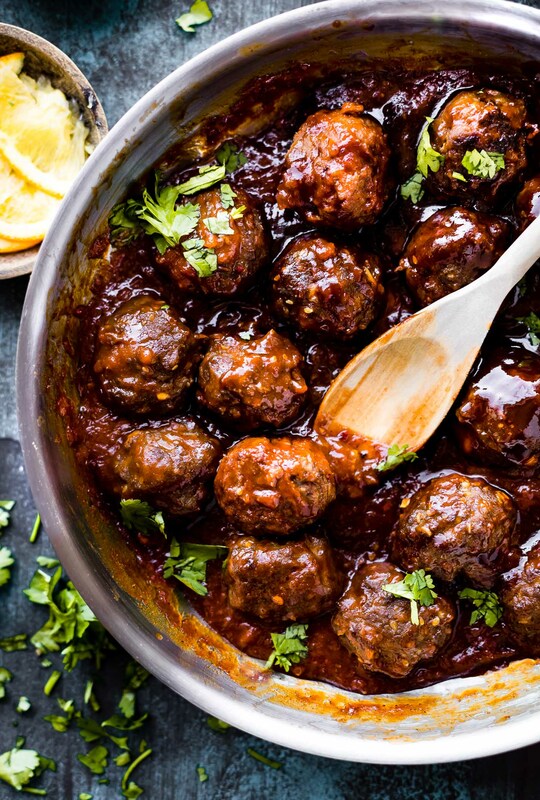 You absorb more iron from the beef in the meatballs, giving you energy and . Plus you get a boost of immunity from the orange and broccoli (Vitamin C). Now we can all feel good about feeding our families and fueling our bodies. Amen amen! Although, if you serve these meatballs as an appetizer at a football party, maybe just call them saucy and good for you. You could even serve them with veggie chips, and no one will ever know they are getting a boost of Iron. See, sneaky sneaky. Healthy food does not have to be boring. Eating right (for you) does not have to be complicated. If you are low in iron, watching your sugar intake, and needing to push that protein, this is the dish for you. I know I sound like an ad or like a corny PBS commercial, but it is true. Food really does have its purpose. And today that purpose is to make you and your family feel superFOOD good. I can sense you all are getting HANGRY! Saucy snappy recipe coming right up! 1 lb lean ground beef – 85% fat to 95% works best and grass-fed is best source (see notes). 1/2 cup gluten free hoisin sauce (for paleo version, see notes). Cilantro and Sesame seeds to garnish. See notes for what to serve it with. Make sure your meat is cleaned and ginger is finely grated. Then place all meatball ingredients in a large bowl, add the whisked egg last. Using a hands or a stand mixer, mix all ingredients until combined. Add optional sesame seeds. I find a stand mixer works best to get a good even mix. Place on greased or lined baking sheet. Bake at 450F for 12-14 minutes, turning halfway, until they are firm and slightly cooked/browned. Once cooked, discard the extra the grease or extra fat from the pan. 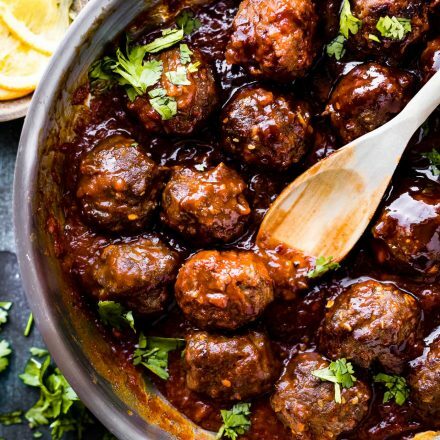 Place the meatballs on plate in a bowl while you make your sauce. While the meatballs are baking, feel free to mix up your your Orange Hoisin sauce. Blend together all ingredients listed in the orange hoisin sauce. 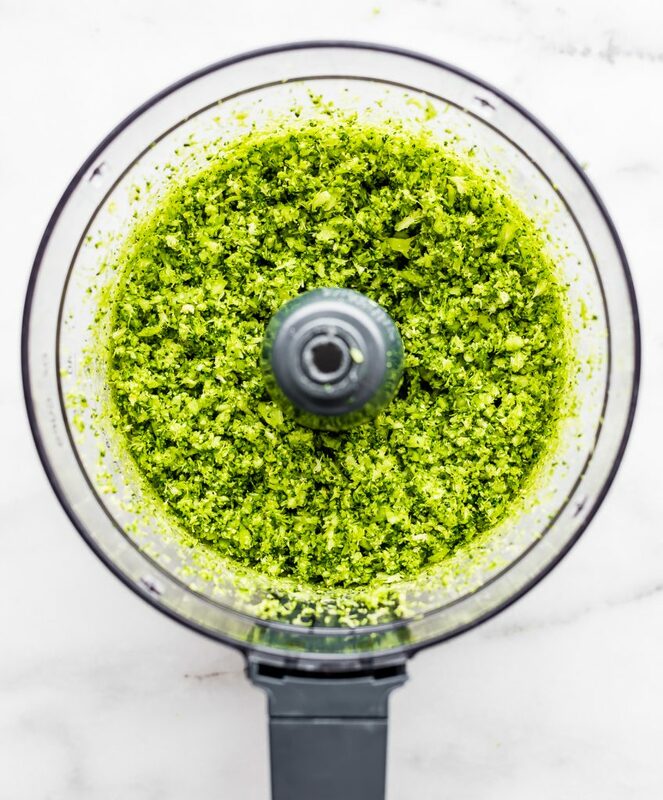 Best to use a hand held blender, food processor, or blender. Then pour the sauce in medium pan or deep skillet. Bring to a soft boil then reduce. Place your baked meatballs in sauce. Simmer for 10 -15 minutes turning and coating all the meatballs evenly. Once cooked, remove and Garnish with extra cilantro, chili pepper flakes, optional sesame seeds. If not serving right away, keep in sealed container in fridge or freeze for later. I like to serve these as appetizer, with steamed broccoli rice, or cooked rice noodles. Serve with broccoli rice, cauliflower rice, white rice, rice noodles, or even as an appetizer. For natural gluten free hoisin sauce, we use Wok Mei. If using 85% fat content meat, you will need to add 4 tbsp of starch, versus 3. Adjust if needed. Cotter Confession -> These are the meatballs that I hid from my husband (aka the Kiwi) so that I could have them all. If you follow me on IG stories, you will have seen my sneaky wife moves. Shame on me, but hey, at least I was well energized afterwards. Poor Husband..
What’s the first dish you made this year that left you feeling refreshed, nourished, and healthy?! Meatball lovers, this one is for you! Veggie lovers, you can TOTALLY use this sauce and make your own veggie meatballs or cook with gluten free tempeh! ← What’s Your One Thing? Time Refocus in the New Year! SO MUCH FLAVOR. These sound perfect, Linds! Yes! I’m so happy it’s the start of a new year. Definitely feeling focused and motivated! Out with the bad and in with the new! 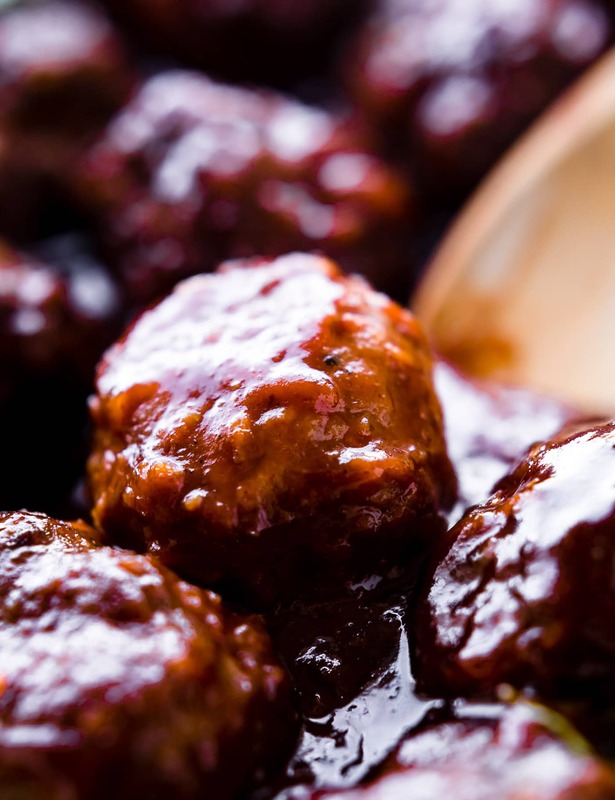 These BBQ meatballs look like they would be perfect for the Super Bowl! What delicious looking comfort food, count me in! You know me… I’m all about the balls! HAHAHA! I need to try these when I get home. I immediately thought of your sriracha balls, which we loved. Love the orange you’ve added to the sauce! This recipe makes me even more excited to get my hands on your cookbook! Love the idea of using these as an appetizer! OMG that is hysterical about hiding them from the hubby. I don’t have that problem with my boyfriend. It’s hard enough to get him to eat well. You fueled your husband for years so he shouldn’t complain! Haha true! But I’m guessing your boyfriend will start craving your food more and more! Thanks Natalie! Let me know if you try it! Haha yea! glad we are not alone in hiding food from spouses. What’s lynne’s favorite dish of yours? OMG were you reading my mind? haha, I was just about to talk about to post this on IG and mention my love for the dark background with red nails. LOL! and the nerdy nutrition. Same brain wave! YEA! Alll the meatballs, please. These look SO good- and love that they’re virtually guilt free! Our 10 year old Cole would go crazy for these! I’m drooling all over my keyboard Lindsay! These look incredibly yummy! That sauce!! Thank you Mary Ann! I’ll share with you any day! I would love to try these. They look sooo good! 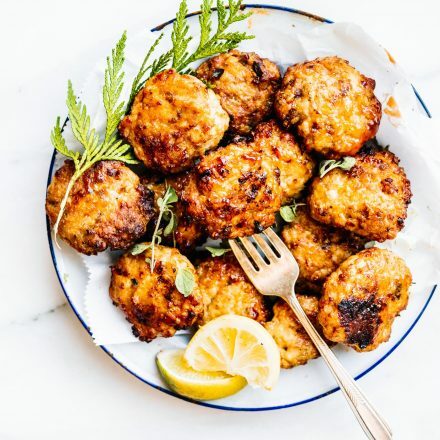 One of my favorite foods are meatballs and these are not disappointing! I would eat these any night of the week! Yumm! I have a quite similar recipe to yours. It’s very easy and fast to make! Can’t wait to try your version. Thanks for sharing. 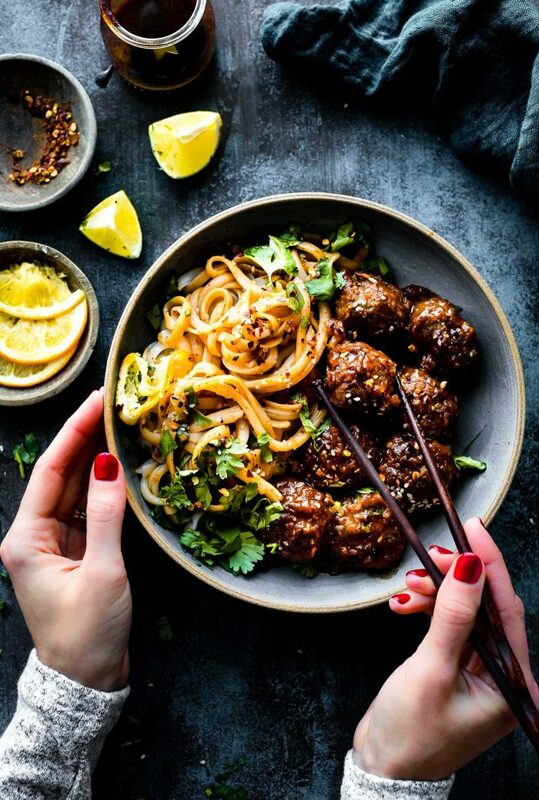 Do you do any type of sauce or seasonings for the rice noodles you serve with the meatballs? I used the extra sauce from the meatball pan. You could also use a little bit of sesame oil and pepper. Hope that helps! This looks really fantastic! I loved more when it’s extra spicy. look so beautiful and interesting-That dish looks very attractive. I will proceed to do it now!